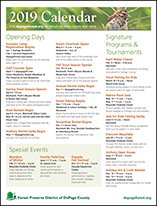 See all upcoming programs and events at our DuPage forest preserves and centers. Want our 2019 calendar (PDF) for your fridge? Download and print it.